The American tradition of the family farm is in danger of fading away as there are now less than a million people in the U.S. that claim their primary occupation to be farming. This represents a loss of almost 5 million farms since 1935. Family farms, exhibiting self-sufficiency, are the foundation of our rural communities. Communities benefit from the local farmers as they purchase their goods from local merchants and provide jobs which enhance the local economy. This produces a winning combination for all. Usually sold within 24 hours of being harvested, fruits and vegetables produced locally are fresher and taste better than produce which has been shipped for a long period of time. Statistics show that produce purchased in supermarkets may have been shipped from distant states and countries traveling an average of 1,300 miles for as many as 7 to 14 days. When eaten at the height of ripeness, one reaps the benefits of the exceptional flavor and nutrients of the produce. You can do your part to ensure that there will be farms in your community in the future and that for generations to come there will be abundant and nourishing food. It’s as easy as buying fresh and buying local. LOOK FOR THE LABEL and TASTE THE DIFFERENCE. 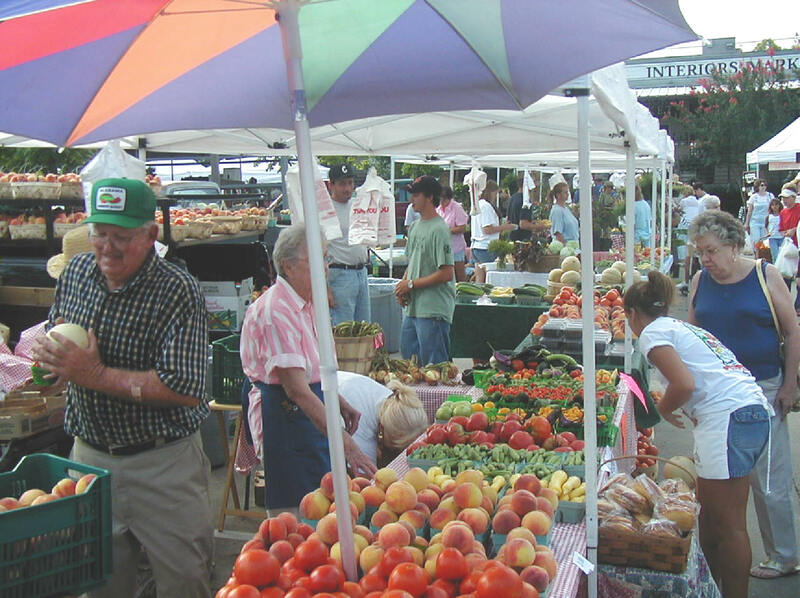 Shop at your local farmers markets or farm stands where you will find the freshest food available. 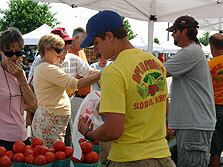 One is probably near you as there are more than 112 farmers markets and 175 farm stands in Alabama. Also, encouraging your local restaurants and grocery stores to purchase from local farmers will be of benefit to you and your community. 1. Buying from the local farmer not only financially benefits the farmer but the community as well. Today’s farmer receives less than 10 cents of the retail food dollar. 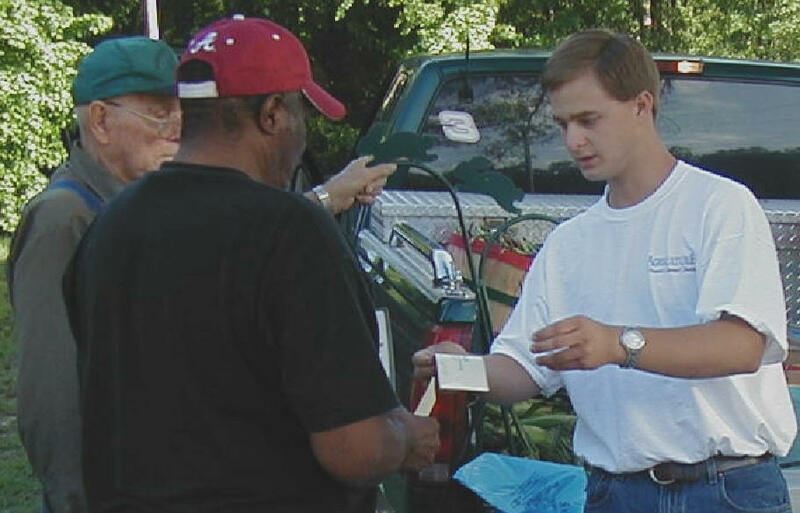 When farmers sell directly to the consumer, the middleman is cut out thus producing a higher profit for the farmer. The farmer then circulates his profits throughout the community with local merchants creating a cycle that helps to build a strong local economy. 2. Buying from the local farmer allows him to profit which in turn reduces the likelihood that he will have to sell his land for development. Agricultural landscape will only survive as long as the farmer is profitable. Family farms that are well-managed value the resources of fertile soil and clean water. Cover crops are grown to prevent erosion, replace nutrients and capture emissions. Many species of wildlife are in a perfect environment in the patchwork of our farmers’ fields, hedgerows, and ponds. 3. Buying from the local farmer ensures healthier and better tasting food. Studies prove that fresh produce loses nutrients quickly. Produce purchased locally was probably picked within the past day or two and provides crispy, sweet and flavorful food. Eating healthy, locally grown food not only strengthens your family but your community as well. Food that is shipped long distances is bred for a longer shelf life, not for taste. 4. Buying from the local farmer helps to protect genetic diversity. 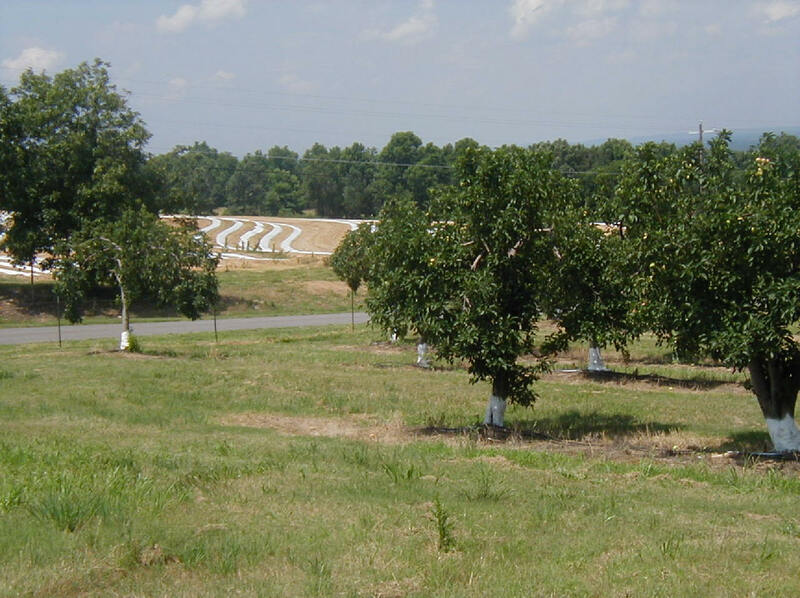 There is little genetic diversity in the produce grown to meet commercial standards. Only varieties that can survive shipping, transporting and have a long shelf life are chosen. Therefore, only a few hybrid varieties of fruits and vegetables meet those demands. On the other hand, local farmers that sell to local grocery stores and restaurants can produce a wide variety of produce, some of which are heirlooms passed down from generation to generation because they taste good. 5. Buying from the local farmer helps protect our environment. Local food doesn't have to travel far. This reduces carbon dioxide emissions and packing materials. Buying local food also helps to make farming more profitable and selling farmland for development less attractive. 6. Buying from the local farmer helps safeguard your health. Knowing where your food comes from and how it is grown enables you to choose safe food. Buy food from local farmers you trust.